It’s not every day you see a beard-shaped basketball net, but then again, when a company defines its brand promise as “weirdly awesome,” nothing should come as a surprise. That quirky character is exactly what candy company Trolli (inventor of the gummy worm) wanted to share with NBA fans on Jan. 20 when it unveiled Beardsketball, a tech-driven basketball experience centered on brand spokesman and Houston Rockets star James Harden, who is known for his eccentric personality and bushy beard. Harden’s relationship with the brand launched in 2016 with traditional TV spots, but in 2017 Trolli is elevating the partnership and the company through experiential to showcase just how weirdly awesome both the brand and the bearded athlete can be. That vision first manifested itself in Houston at the Rockets-Warriors game, where attendees lined up around the concourse to play Beardsketball. The fan experience began the moment attendees walked through the door of the Toyota Center. After being greeted by the PaTrolli, a group of misfit characters that includes “manicorns” and a cyclops, fans were gifted with pink beards and branded sunglasses to get the momentum started. Further down the concourse, they received a t-shirt and an invitation to step into Harden and Trolli’s wacky world with a game of Beardsketball. 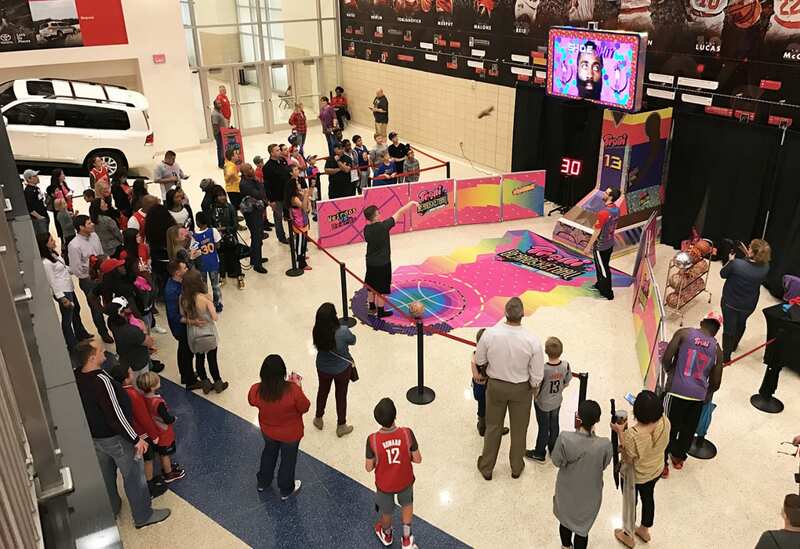 Featuring an 80-inch, NBA-sized backboard, the Beardsketball experience gave participants the chance to take on Harden one-on-one thanks to technology that transformed the backboard into a digital screen. From the display, Harden directed fans to take a trick shot, hook shot or shoe shot (take off your shoe and toss it) through a beard-shaped net, then either praised or teased the participant based on their performance. 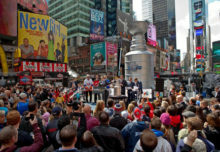 Phrases like “You just made my beard tingle” or “Brick!” were among myriad responses fans could receive while interacting with the digital Harden, who also showcased a number of different gestures and facial expressions to make the experience unique to each participant. 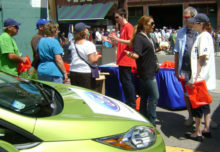 Social media was also a critical part of the activation. Before stepping onto the court, fans tossed on a pair of Snapchat Spectacles, allowing them to capture their individual Beardsketball experience and broadcast it to their followers using #TrolliBBall. Even Harden himself sported a pair of Spectacles while warming up for the game to give virtual fans a glimpse of all the action—and there was plenty of it, from pink beard-wearing attendees enjoying free Trolli candy in the stands to fans lining up well past the end of the game to get a shot at Beardsketball. “This is the best activation I’ve ever been involved with—not just from the brand perspective, but from the fans’ perspective,” says Jill Manchester, svp-brand and marketing strategy at Ferrara Candy Company. “You know that you’re onto something when you see that authentic engagement and passion… [Harden] has this passionate fan base, the NBA has this great fan base and we are inserting Trolli into that conversation and it’s driving our awareness.” Agency: Periscope, Minneapolis, MN.